If it's your first time at the salon please see our Cut and Blow-dry offer. For colour please see our Full Head Highlights or Full Head Colour offer. If you have been to the salon before please see our introduce a friend offer. Yes, we do offer free consultations for all of the services and there is no obligation to make an appointment. A free consultation will allow you to get to know the hairdresser and help you to decide if this is the right salon for you. Will I need a skin allergy test? All Colours or Highlights require a skin test at least 48 hours before your appointment. You will still need to come for a skin test even if you have had a skin test colour or highlights at another salon. You do not need an appointment for a skin test because the skin test only takes two min to do. You can simply walk in most days between 10:30 am - 4:30 pm (closed on Sundays and holidays). You just wait 48 hours to see if there has been any reaction. Once done the skin test is then valid for 30 days. Clients must be at least 16 years old. For the test we apply some colour onto your skin usually behind the ear. Leave it there for 48 hours without washing or touching it. Look out for anything unusual like redness, swelling, burning or itchiness. If you notice something let us know and also seek medical advice. Will my colour fade quickly? It is normal for colours to fade particularly if they have been applied to pre-lightened hair (hair that has been made lighter with bleach), or if the hair has been exposed to a lot of sunlight. In such cases colours needs to be topped up every couple of weeks to refresh the colour and will become longer lasting with time. Also the colour will last longer if you wash your hair once or twice per week, as apposed to washing your hair every day. It's best to keep your hair protected by a sun hat or cap. Use a sodium chloride/sulphate-free shampoos and conditioners to extend the life of your colour. How experienced are your stylist? The stylist at this hairdressers have at least ten years of experience and are all at a very similar level. Trainees are not employed at the salon. 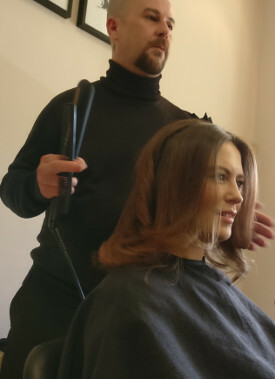 The same stylist will be with you throughout the service. For more information on each stylist please go to the salon home page and click on the "More about" link for each hairdresser. What can I do if I do not like my hair? When it comes to hair everything can be fixed. In most cases cuts and colours can easily be adjusted. The original stylist would be the best person to correct their own work. Please feel free to contact the stylist and book another appointment withing 2 weeks and this is usually at no exta charge. 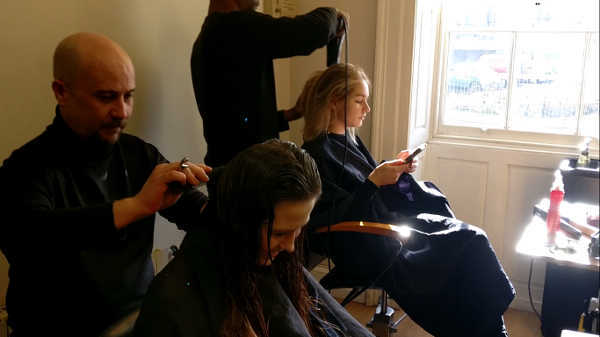 Does your hairdressers accept contactless payments? Yes, we do. We can accept payment from contactless cards or contactless devices like smartphones. We can also accept payments by chip and pin or cash. I'll be coming to get my hair done during my lunch brake. Will the stylist mind if I answer my phone or if I work on my laptop? Working on a device like a tablet, phone or laptop is something which will help you and is not a problem at all. If you are waiting for an important call, it's totally fine to answer the phone while the stylist is doing your hair. We would however like to ask if you could limit each call to just a couple of minutes as the actual device can get in the stylist way. Please note if the phone is used with earphones, it may still be in the way or get accidentally damaged. Can I get a free fringe trim at your hairdressers? Yes, of course. We do not book appointments for a free fringe trim. Instead you can pop in any time the salon is open. However please note that this is subject to availability i.e. you may have to wait for a few minutes if no hair stylists is available. Please note that this free service is only for the reshaping of an existing fringe. Must I book a hair appointment many weeks in advance? We sometimes have last minute appointment available and you can call us on Tel: 01912619651 or choose a stylist from our home page to book an appointment online. To avoid disappointment please book your hair appointment at lease 2 - 3 weeks in advance. Can I still get my hair done if I come late for my appointment? I you know that you will not be on time for your hair appointment, please let us know as soon as possible. Your hairdresser may be able to fit you in later on that day. It can depend on how busy the stylist is. If it's not possible for your regular stylist to do your hair. We may suggest that you have your hair done by another stylist. Sometimes it may be necessary to reschedule your hair appointment for another day. What are your hairdressers opening times? Some of the stylists have working hours which vary greatly from the salon's general opening times. If you go to the salon opening ours page, there you can click a stylist and choose a calendar date to see each stylist's actual hours of work. 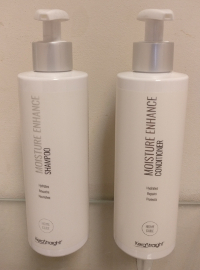 Which products do you use at your hairdressers? We do not use only one brand of hair products. Instead we choose different products from various hair companies that we think work well. For example for colour we use Loreal Majirel. Indola for high lift lightening. Yuko for permanent straightening. Kerastraight for Brazilian Blow-drying, Finally for styling hair we use Schwarzkopf, Osmo and Wella. Does your salon stay open late on any nights? We used to stay open late on Thursdays but we do not offer late nights at the moment. You can check the salon's opening hours at the salon opening hours page. Is it OK to come to the salon with dirty hair since it's going to get washed anyway? Turning up with dirty hair is fine. However if you haven't washed your hair for two or more weeks or if it is starting to have an odor then we would ask you to please wash it before coming to the salon. I have coloured my hair black but would now like to go blond. Can you do this for me? It can also depend on the condition of the hair. Something as dramatic ask going from black to blond may not be possible in just one session as we would need to protect the hair and keep it healthy. Sometimes it may not be possible to do at all. Consultations are aways free if you would like some advice regarding this. Often this would be classed a "colour correction" and prices can start from Â£130. For a free consultation you can call us on Tel: 01912619651 or choose a stylist from our home page to book a free consultation online. I have hair extensions. Can you cut and blow-dry my hair? Where in Newcastle is your hairdressers located? 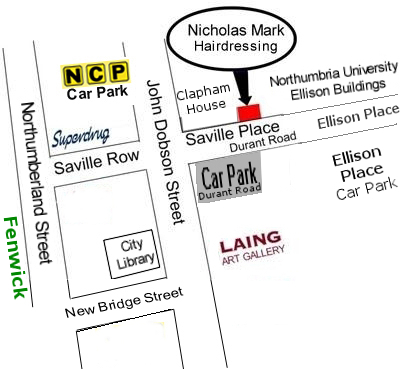 The salon is at 5 Saville Place in the centre of Newcastle upon Tyne and only 2 minutes from Northumberland Street. For step by step directions please see how to find the salon. Does the salon have parking? This hairdressers does not have it's own parking but there are car parks nearby e.g. the car park on Durant Road, the Ellison Place car park next to Mea House, and the NCP on John Dobson Street. Please see the above map for the nearest car parks to the salon.